480 pages | 52 B/W Illus. To set the groundwork and mitigate the difficulties newcomers often experience, An Introduction to Complex Analysis begins with a complete review of concepts and methods from real analysis, such as metric spaces and the Green-Gauss Integral Formula. The approach leads to brief, clear proofs of basic statements - a distinct advantage for those mainly interested in applications. Alternate approaches, such as Fichera's proof of the Goursat Theorem and Estermann's proof of the Cauchy's Integral Theorem, are also presented for comparison. Discussions include holomorphic functions, the Weierstrass Convergence Theorem, analytic continuation, isolated singularities, homotopy, Residue theory, conformal mappings, special functions and boundary value problems. 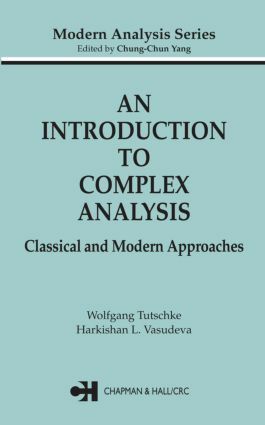 More than 200 examples and 150 exercises illustrate the subject matter and make this book an ideal text for university courses on complex analysis, while the comprehensive compilation of theories and succinct proofs make this an excellent volume for reference. "Many things, which are briefly described in others books, in remarks or exercises, are given in full detail … . [It] will please readers interested … in applications as well as those who want to know how things really work and prefer deeper and more detailed treatment of the material. The book also contains more than 200 examples and 150 exercises. … I recommend it for courses in complex function theory … and also as a reference book." "… [A]bundant examples and 'hints' to aid readers [are provided]. Summing Up: Recommended. Upper-division undergraduates through professionals." "For the unification of the structure of mathematical analysis as a whole, it is imperative to use results of real analysis when laying the foundations of complex analysis. This is done in the present book."